Hey loves! It’s that time of the month again where I share my hits & misses of the past 30-ish days. As you all know, I’ve been trying a lot of different brands on my channel and I also did a huge Sephora haul in May. So it’s safe to say I’ve been playing around with makeup a lot during the month of May. Most of the items I tried I really enjoyed, but of course there are also a few things I didn’t like as much. Keep on reading to find out what I’ve loved and didn’t love as much in May! If you like texturizing salt sprays, this is a really good cruelty-free & vegan option! It smells good and works wonders when it comes to adding volume and texture to my hair. During the warmer months my skin is a little bit more oily and therefore I need a moisturizer that’s a little bit less heavy on the skin. This one by The Ordinary is really lightweight and moisturizes my skin perfectly! The formula, shade and packaging of this Too Faced bronzer is perfection! They recently rebranded their bronzers and I finally decided to pick one up. Sun Bunny is a beautiful warm bronzer with a hint of sheen that looks stunning on the face! This entire new Brush Crush collection is freaking gorgeous, but the kabuki brush in particular is the one I’ve been grabbing for the most. It’s amazing for applying setting powder all over the face since it’s so soft and big. Eversince I got my hands on this highlight I haven’t been able to put it down. The formula is so soft and gel-like and the shade is beautiful! 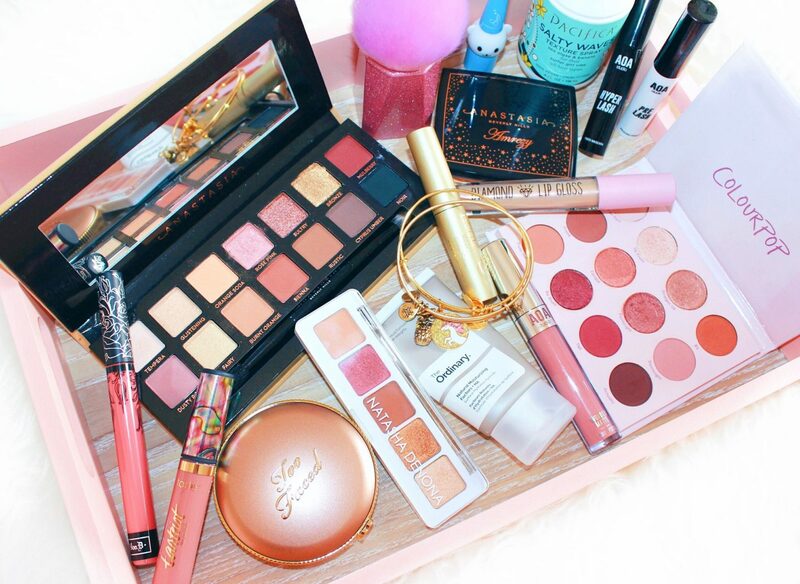 This is such a stunning everyday palette with beautiful shades in it. As we all know, I adore the Colourpop pressed shadows and this is no exception to that! One of my favorite eyeshadow palettes ABH has ever come out with! The shade range in this palette is so on point and the quality is out of this world. There is quite some powder kick-up though, but I personally don’t mind it that much. Even though I only got a mini sample of this mascara, I’m already obsessed with it. It’s very volumizing, but you do have to be careful not to build it up too much otherwise it can get a little bit clumpy. For only $1, this is such a good liquid lipstick! This shade in particular is so beautiful, but you do have to reapply it more often than higher-end liquid lipstick formulas. Again, for only $1 this is a gorgeous lip topper with a super shimmery finish! It’s not too sticky, but the lasting-power isn’t the best. This shade is SO beautiful, I’ve been wearing it a ton these past few weeks. It’s a muted peachy pink shade that looks really good on my skin-tone. Even though I already own a million of these neutral shades already, I love this shade and formula! This was part of Tarte’s mermaid collection, but I think the shade is also in their permanent range with regular packaging. I’ve been collecting Alex & Ani charm bangles for quite some time now and I recently got my hands on a few new ones that I’m obsessed with! The pineapple and unicorn charm look so good paired together and I just love how they look overall. This eyeliner is SO dry and it doesn’t even show up on my eyes at all. Even though it only costs $1 and looks really cute, it’s really not worth it! The lash primer didn’t do anything for my lashes and the fiber mascara was horrible. Fibers kept falling down my face, getting into my eyes,… throughout the entire day, what a nightmare! Again, even if it’s just $1, NEVER pick this up! I’m including this one in my misses simply because I was so underwhelmed by this palette. It’s not bad at all, but Natasha Deanna palettes are so expensive and hyped-up and I was expecting so much more from this. What were your hits & misses for the month of May? Anything you absolutely loved or hated? Let me know!